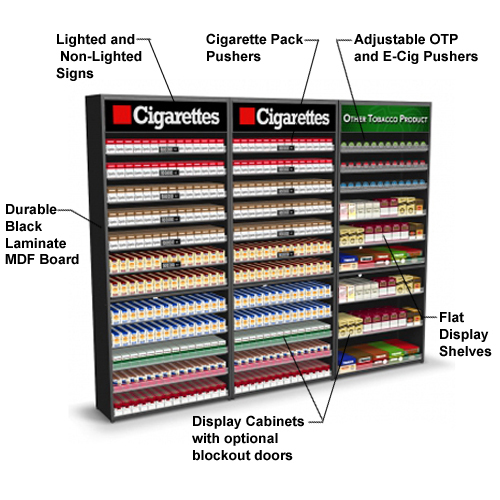 The acquisition of a Tobacco Fixture or Cigarette Display is more than just an equipment purchase. It is an investment in a marketing and sales tool with the potential to boost your bottom line! Here are a few factors a retailer should consider before making an investment. 2. How much of each product you will carry in the fixtures? Knowing this will help you avoid overbuying or underbuying a fixture for your product needs. How many cigarette facings do you require? 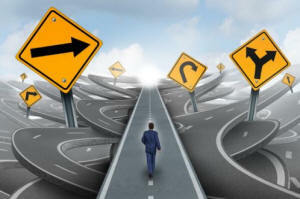 Keep in mind, you may want to double-up or triple-up on your most popular or fast moving brands. How many snuff or chew facings do you require? Snuff and chew pushers are adjustable in width (we call them OTP pushers), making them different that cigarette pack pushers. It's important to know how many of these adjustable pushers you require in order to purchase the appropriate fixture. How many flat shelves do you require for cartons or other display products? Flat display shelves are great for cartons and pre-boxed tobacco products. If you are unsure about using flat shelves, we can provide a flat shelf with removable pack or OTP pushers that may be removed if a flat shelf is needed in the future. How many E-cigarette or Vapor product pushers do you require? Single packed vapor cigarettes, single packed e-cigarettes and vapor juice all require a pusher that is taller and more narrow than our standard OTP pusher. Knowing how many of these products you'll carry will help us determine how many of our specialized tall/narrow pushers you will need. or a behind the counter tobacco fixture. If you have limited space behind your cashier counter, you may opt for our Overhead Fixture or Under Counter Fixtures. If you do have space behind your cashier counter, will you require a floor standing fixture or one that sits on your countertop? 4. How much space do you have available to install a tobacco fixture? Knowing this will help determine the maximum height and width of the tobacco fixture. Our Overhead Fixtures are modular in size at 25 3/4" (65.4cm) wide x 21 1/4" (54cm) deep x 24" (60.96cm) high and have forty (40) facings. If you require more than forty (40) facings simply install additional units. Our Easy-Rack Cigarette Displays are available in nominal sizes of 2ft, 3ft and 4ft wide and 2ft, 4ft, 6ft and 8ft tall. Our Metal Frame and Wood Frame Fixtures are available in nominal sizes of 2ft, 3ft and 4ft wide and 4-1/2ft 7ft tall. 5. How much storage capacity you will require? Knowing this will help determine base cabinet requirements and other storage options. Our Wood Frame Fixtures are available with solid hinged doors on the base cabinet. Our Metal Frame Fixtures are available with solid hinged doors on the base cabinet or a base cabinet with double drawers. 6. What is your budget? Knowing this will help determine which line of product you can afford and still meet your merchandising needs. Our Metal Frame Fixtures will be the most expensive of the behind-the-counter options. Our Wood Frame Fixtures and Easy-Rack Cigarette Displays will be similar in price for cabinets in the 4-1/2ft tall to 7ft tall range. Our "04" series Easy-Rack Cigarette Displays are budget friendly countertop displays, perfect for a small space and limited budget. Some tobacco companies do not allow product displayed below 24". Therefore, we can provide a 24" tall door for your base cabinet. Some tobacco companies require a fixture that is a minimum of 3ft wide. Some tobacco companies will reimburse you for part or all of the fixture cost, but require the fixture to have a lighted header sign. Some tobacco companies will not allow another company's product in the same fixture. Therefore, you would require multiple fixtures. will help determine the style of tobacco fixture and option accessories such as adjustable pushers and shelves, hook bars, scroll pricers, etc. give us a call and we will help you find the ideal fixture or display.